After deciding she was serious about this expedition, Kate posted an advert online looking for a female teammate. Three months later and after over 80 people from across the world had got in touch with her, Kate received an email from Anna, expressing interest in the expedition. A brief conversation later and it transpired that not only had Anna and Kate gone to the same school, they still lived only a few miles away from each other. Our team of two sorted, the next challenge was to find somewhere we could start kayaking. 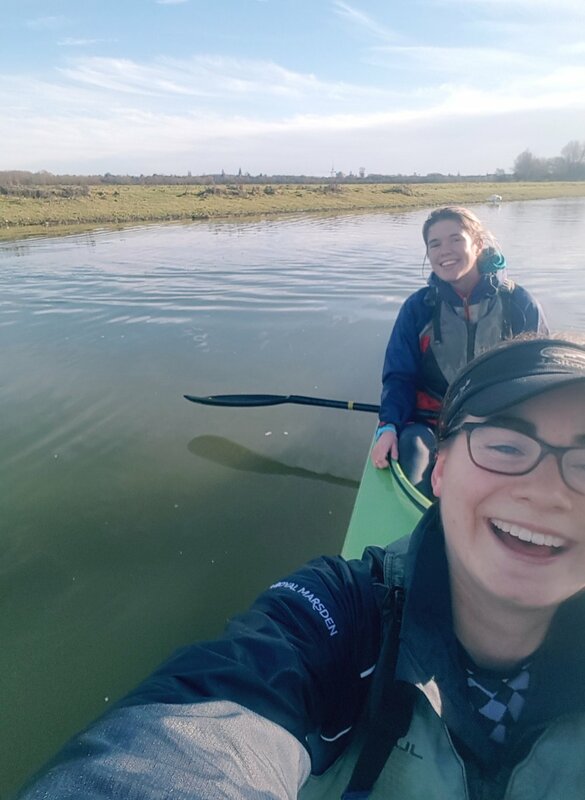 We are both competent paddlers but there is still a lot of work to be done in terms of developing the skills, fitness and confidence needed for a trip of this size. We’re very lucky to have the support of the fantastic members of the Falcon Canoe and Rowing Club in Oxford, where we will be spending many hours over the coming months refining our skills and fitness under the watchful eye of the experienced coaches. Our first training session was a huge success, something that came as a bit of a surprise to us both! We were taken out for a few hours of paddling by the wonderful David on a crisp and clear autumn morning. After the initial five minutes of wobbling around on the water and wondering whether the whole plan was completely daft, we began to relax. As our confidence increased, our paddling got stronger, and before long we were cutting through the glassy water, smiles adorning our faces. Ten miles and several portages later we returned to the boat house feeling optimistic about what we have in store over the coming months. We're really excited to be able to share this journey, from these early (and slightly overwhelming) stages of preparation and research, to embarking on our adventure and hopefully completing it in one piece! The five per cent survival rate of pancreatic cancer has barely changed in nearly 50 years. Stamping out late diagnosis can change this. Pancreatic Cancer Action relies on the generosity of people like you who donate to fund research into early diagnosis, educate medical professionals, increase awareness and support patients. See more of what they do here and sponsor us by following the link below. We are also looking for sponsorship from businesses and organisations who are in a position to contribute towards the costs of the expedition, from the safety boat accompanying us across the English Channel to the meals that will fuel us during this epic challenge. If you think your business may be in a position to offer us support, please get in touch by either sending an email to hello@kayakingthecontinent.com or by filling out the contact form below.